The Marvelous Mrs. Maisel’s sophomore season is right around the corner at Amazon Prime. A new trailer was released this Thursday to let the show’s eager audience know exactly what to expect from the new, and relatively undisclosed, season. With shots of Midge travelling to the Catskills and further exploring her comedic voice on stage, the new season will certainly be both adventurous and enlightening for the complicated group of characters. The comedic series, which first premiered in November of last year, centers on the life of Midge Maisel (Rachel Brosnahan), a young mother who faces complete chaos in every aspect of her life. That is, however, until she discovers her genuine talent as a stand-up comedian. Comedy comes easy to her, with words flowing from her voice that can’t help but make her audiences giggle and come back for more. A pioneer in the stand-up comedy realm, Midge is a woman who both literally and metaphorically bears it all to the listening ears that fill the room. 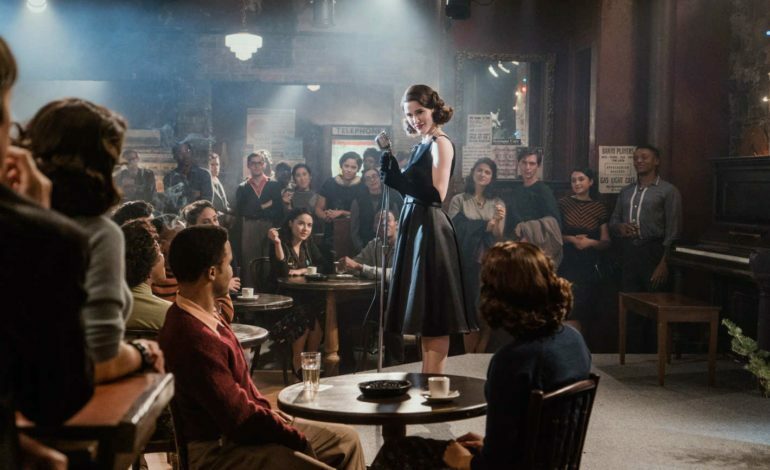 Set in the 1950’s, The Marvelous Mrs. Maisel repeatedly brought out both the grit and beauty in the streets of Manhattan, and has brought many of these locations back for the second season. However, much of the upcoming installment of the series appears to be set in a more vacation-like retreat of beaches, mansions, and clubs. This will undoubtedly bring a new twist to the series, but is certainly not unwelcome. The show was created by Amy Sherman-Palladino, the creator the hugely popular series Gilmore Girls that aired back in the early 2000s. Like her first show, this one mixes witty comedy and compelling drama in each episode. Since then, Palladino had been laying low before returning with another bang, The Marvelous Mrs. Maisel. The show was bombarded with critical acclaim after it’s release, having won two Golden Globe Awards, one for Brosnahan’s performance as the leading lady, and the other for the title of Best TV Series, Comedy. Along with this feat, the show was then nominated for 14 Emmy nominations. The trailer has also verified the return of several characters most close to Midge, including her husband, Joel (Michael Zegen), her comedic mentor, Susie (Alex Borstein), as well as her always-unsatisfied parents Abe and Rose (Tony Shalhoub and Marin Hinkle).